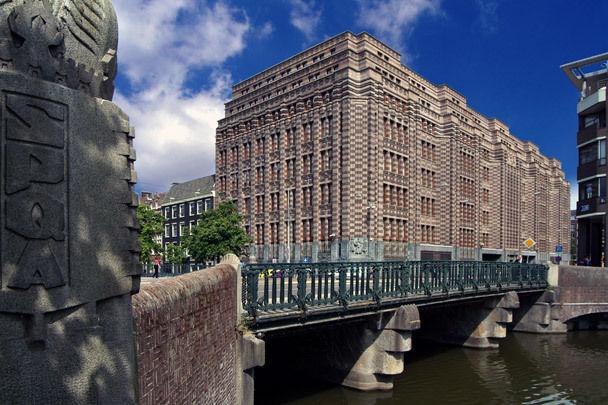 This design for the Netherlands Trading Society by De Bazel, the last he worked on, was much criticized for its monumentality. The vast building volume was treated almost as sculpture by giving it a tall basement, two receding upper storeys, much vertical articulation and a geometrically ornamented facade of brick and stone. The concrete frame, concealed on the outside by an impression of stacked construction, has an architectural role to play inside, particularly at the two high light courts. Since 2006 the building has been home to the city's public record office, designed by Claus and Kaan.